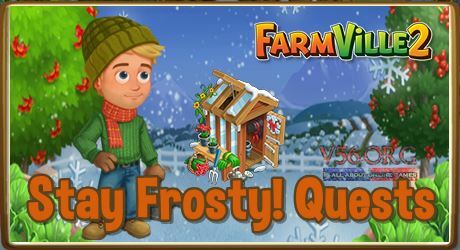 Mission Objective: Did you notice the first snowfall of the season in Farmville 2 Stay Frosty! Quest. The kids are up to their necks in the snow with their snowball fights. Here you will find all the information you will need in completing this mission. You can prepare ahead and plan the best possible approach in completing this mission. The Farmville 2 Stay Frosty! Quest is available from November 27 to December 11. Quests 1: Farmville 2 Snow Feed! Quests 2: Farmville 2 Chillin’ In The Snow! Get 5 Snowman Contest Forms. Make 3 White Feather Wreath. Quests 3: Farmville 2 Snow Much Fun! Have your kid or sweetie do 1 Foraging job. Quests 4: Farmville 2 Ice & Smooth! Make 4 Cranberry Raisin Cake. Quests 5: Farmville 2 A Fig Idea! Quests 6: Farmville 2 Ferreting About! Quests 7: Farmville 2 Ice On The Prize! Quests 8: Farmville 2 S-carve A Memory! Tend your Spinning Wheel 2 times.